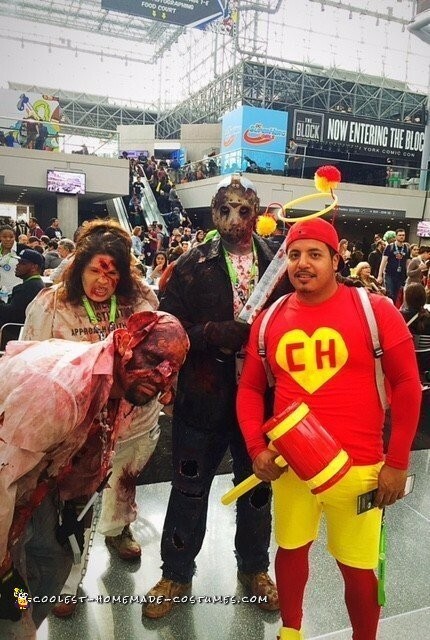 I decided to cosplay with El Chapulin for the first time this year, so what better place to do it at than at New York Comic Con 2015! For the Converse sneakers I added red laces also to give it a little extra pop. I cut out the letters C H using red felt & glued them (fabric glue) on the side of the sneaker. Around my waist I bought about 42′ in of red belt strap fabric material also a black clip to tie it all together (like a belt lol), I than cut a red shirt in the form of grasshopper wings and hot glued that to the belt. I used yellow felt to cut out a heart & red felt to cut out the letters C H. Put it all together using fabric glue (a Non permanent one). The costume uses a red hood but I couldn’t find anything so I just used a Cincinnati Reds hat I had. I sharpied all the white with red; I used 20mm wire w some type of shoelace rope/string thing I found at the hobby store, cut a lengthy piece, inserted the wire thru. I looped it thru the holes in the hat to make antennas. I used youtube to make the pompoms using red & yellow yarn (super easy). Since the actor who played the character passed away last year I added a yellow plastic ring (I think its used for sewing) and hot glued it to the side of the antennas (got the idea from watching Dragonball Z). Lastly I got a clown hammer from Party City & spray painted it yellow & red. 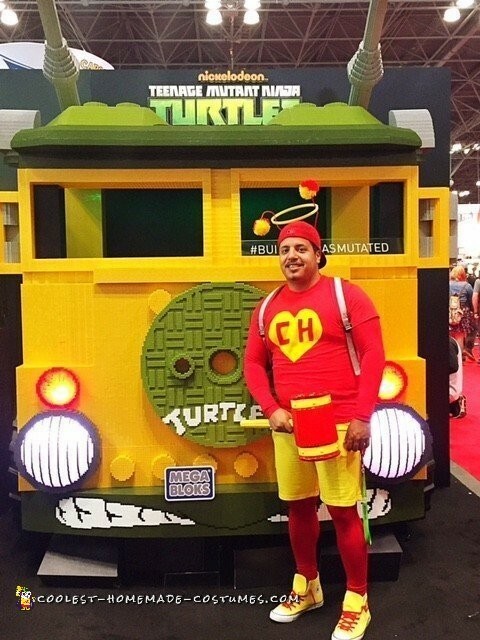 All in all the El Chapulin costume was fun to do this. A lot of people knew who I was and even got asked to get pics taken of me or with me. I definitely will do it again next year.